And when they don't get over, you're stuck behind them for potenially hours. Here in the US, you're generally allowed to pass in any lane to avoid such a situation. Yes, traffic should keep right, but if it doesn't, the law doesn't penalize the passer. Left lane camping is one of my biggest pet peeves. It seems to be a problem in Ontario, and I'm sure that our low freeway speed limits of 100 km/h are partly to blame. My friend drove me and two other friends to Toronto a year ago and he stayed in the left lane the entire time we were on the 401 (65 km!). Naturally, he was doing 100-105, despite the fact that the unofficial speed limit in Ontario is 120. Needless to say, we got passed on the right countless times and got glared at by many drivers. His defence was that he was technically speeding, and therefore he could use the fast lane . He doesn't seem to do this as much anymore, probably after being criticized by friends and family. I've given up on the no-passing-on-the-right suggestion. In my mind, if I can pass on the right, the driver I'm passing is likely in the wrong lane! In fact, in Ontario, it's not uncommon for the right lane to be empty. This is because the left lane can be blocked by a slow driver, the middle lane is seen as the default lane for many drivers (so they don't have to deal with trucks in the right lane). I'm willing to use the right lane for passing if people are blocking the left lane. Big problem out here on CA 99 between Bakersfield and Visalia. You can end up with a freight train of 60-70 cars sometimes because you'll have slow poke hogging the left lane or not pushing it to pass. Its one of the biggest reasons I avoid 99 like the plague, it is annoying as all hell and actually creates the potential for getting into a huge pileup....especially during the foggy season. Does this board define left lane hogging as travelling at less than the speed limit in the extreme left hand lane or as travelling at less than the speed of traffic? Left lane camping is one of my biggest pet peeves. It seems to be a problem in Ontraio, and I'm sure that our low freeway speed limits of 100 km/h are partly to blame. I define it as a driver who won't move right when safe to do so, especially if someone behind them wants to drive faster. You can end up with a freight train of 60-70 cars sometimes because you'll have slow poke hogging the left lane or not pushing it to pass. The thruway says hello Having traveled from the PA line to Rochester over Memorial weekend, I can relate. 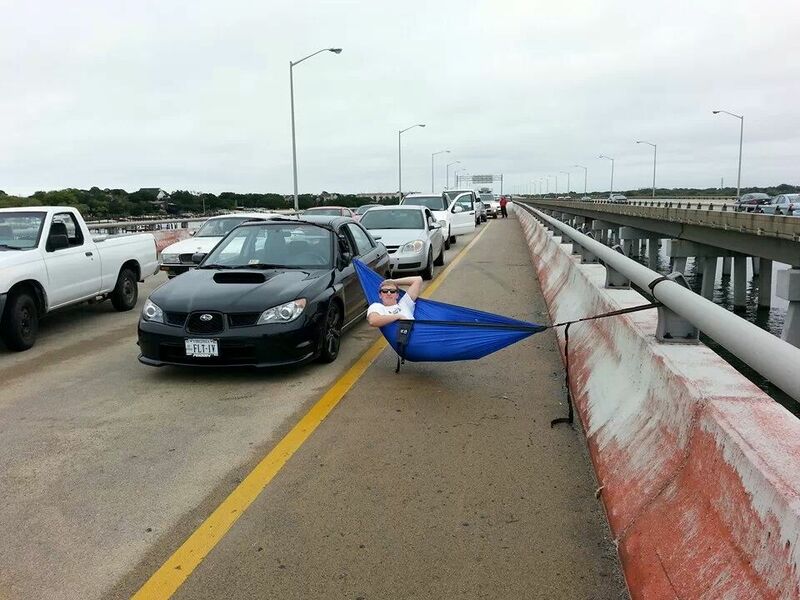 If you're in the left lane and not passing, you're camping. Period. That said, I'll go with "less than speed of traffic" because going below the limit in the left lane is relatively rare in my experience. Usually CA 43 or CA 65 makes for a decent alternate. It seems like most people can't handle a two-lane road, that being the case I'm generally more than happy to be out all by myself even if it is a little slower. I feel very strongly about staying out of the left lane when you're not passing, although I will allow for exceptions when a road is in particularly bad shape such that the left lane has fewer ruts and potholes (the one that immediately comes to mind is Quebec's Autoroute 15 between the border and Montreal, though maybe they've fixed it since the last time I was through there). Aside from that exception, I feel it's rude to make other drivers slow down or pass you on the right, regardless of what speed you're going, and I despise the idea that "I'm exiting on the left five miles up the road, so I'm using the left lane because nobody will let me over closer to my exit" (BS!). None of this applies on most urban or suburban streets, of course, nor on urban or suburban Interstates or similar when the traffic is too congested to flow freely. What if "Car A" is in the left lane at 10 mph over the limit, passing 2-3 cars who are 5 mph over the limit, and "Car B" flies up behind "Car A" at 15 over, tailgating and acting impatient? What do you think "Car A" should do? If those 2 or 3 cars are close together, that's fine. If those 2 or 3 cars are spaced apart so much that I could merge right, pass the vehicle in the left lane, then merge back in the left lane to pass those on the right, then Car A should've gotten over instead. Technically, the board doesn't have any specific definitions. It's up to the forum members, and our definitions will differ. That said, I think the majority of us believe it to be travelling at less than the speed of traffic. Here's my additional take on that: If you're going less than the speed limit, can you drink a beer? Of course not. Thus, you can't camp in the left lane claiming that you're obeying the speed limit law. The laws are separate and distinct, and by following one law, it doesn't exclude you from obeying other laws. Another case in point: If the speed limit is 50, and you're doing 50, you're not allowed to ignore the stop sign on your road. I would continue passing the cars in the left lane, even if there was enough space between cars to let Car B by. If Car B attempted to pass me in the right lane and 'shoot the gap' between the cars i am passing, i would speed up so that they can't get by. When i finish passing the cars i would continue to drive in the left lane with my right turn blinker on. I would then wait for Car B to swerve back into the right lane to try to pass me, at which point i would quickly move back into the right lane infront of Car B (after all, i did have my blinker on). When Car B swerves back into the left lane, i would gun it to match whatever speed they are willing to drive, making sure to stay in-front of Car B. As i approach another vehicle in the right lane, i would move back into the left lane infront of Car B and reduce my speed to closely match the speed of the vehicle i am passing.... maybe going 0.2 mph faster so it would take a very long time to complete the pass. At this point, i know the driver would be enraged so i would finally move over into the right lane to let them pass as they fly by me at 90-100 mph. At this point, you just cross your fingers that there is a cop with his radar gun out a few miles down the road. EDIT: I forgot one thing. In the perfect scenario where the guy gets pulled over a few miles down the road, you honk as you are passing them. It seems that on the three lane section of the Ohio Turnpike driving in the left lane is encouraged. There are overhead signs above the right and center lanes stating that trucks and slower vehicles are to use those lanes. With light traffic, cars drive in the left lanes until overtaken by a faster car. Then the first car pulls into the center lane to let the faster car pass and then returns to the left lane. Trucks almost always stay in the right lane. I've seen cars drive in the left lane for miles on end with the right and center lanes almost empty. Waiting with bated breath to see how any Buckeyes monitoring this thread will respond, since many of them seem to enjoy cruising in the left lane on Kentucky four-lane routes. Hate it. Now, I don't mind it on urban freeways so much, especially if there's a left exit (for example the eastbound exit from I-84 to I-184). With that much traffic, we need the capacity of all the lanes, no point in trying to force yourself over to the right (though if you're over there at least try to keep at minimum the speed limit, if not the flow of traffic; if you don't then I do have a problem). And I get staying out of the right lane near onramps with a lot of merging traffic (again urban/suburban, typically 3-4 lanes each direction). But on any rural highways I hate it and there's no excuse. I see it a lot with drivers with Washington plates, in my anecdotal experience. This is so true. Ohioans are the worst when it comes to left-lane blocking. Washingtonians really aren't that bad about keeping right. Neither are British Columbians. I see it from time to time, but a quick flash of the high beams usually gets them out of the way. Washington's law seems to make sense...general rule of thumb is "drive in the right hand lane", but there are logical exceptions, such as moving over to allow traffic to merge. The one odd thing is subsection B, which states that you must travel in the right hand lane unless you are "travelling at a speed greater than the traffic flow". I'm not even sure how to interpret that. Perhaps an odd way of saying "if you're going faster than traffic, use the left lane", or "no passing on the right"? Upon all roadways having two or more lanes for traffic moving in the same direction, all vehicles shall be driven in the right-hand lane then available for traffic, except (a) when overtaking and passing another vehicle proceeding in the same direction, (b) when traveling at a speed greater than the traffic flow, (c) when moving left to allow traffic to merge, or (d) when preparing for a left turn at an intersection, exit, or into a private road or driveway when such left turn is legally permitted. On any such roadway, a vehicle or combination over ten thousand pounds shall be driven only in the right-hand lane except under the conditions enumerated in (a) through (d) of this subsection. I second that emotion. I sometimes wonder if the Ohio Turnpike needed the third lane for such long stretches if folks used proper lane discipline. On the NYS Thruway, it's Ohio folks that hog the left lane in the western part of the state. In the eastern part of the state it's the Massholes (along with plenty of NYS tags as well). There's also no sleeping bag, either. Now if he was doing it in or with a camper/RV, then I'd say it counts.